Here's some pictures around the ship. 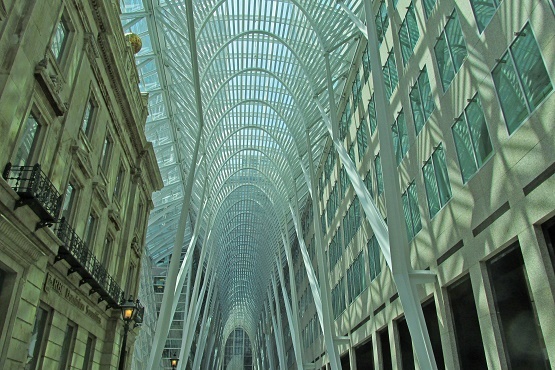 Mike and Sandy spent a night in Toronto, Canada's largest city, before joining the ship. 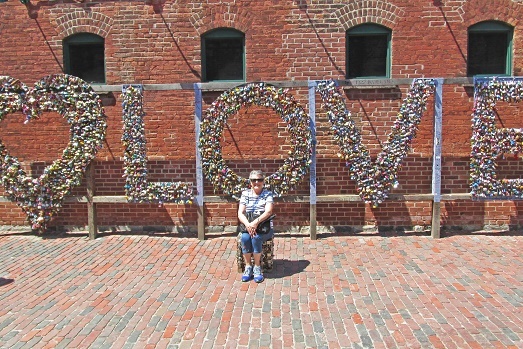 Here's Sandy at a wall of padlocks, being a young lover again, some of the very impressive architecture, and a view of the iconic CN Tower from the window of the m/v Victory as we set off from the harbor. 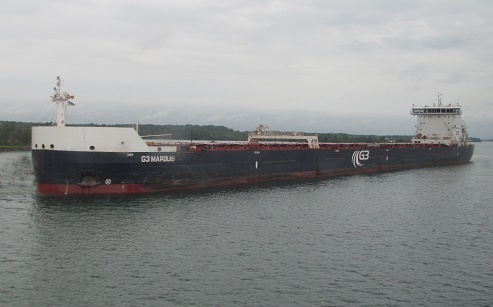 The ship traveled along Lake Ontario, and overnight navigated the Welland Canal, which parallels the Niagra River and its famous Falls, taking the ship from Lake Ontario into Lake Erie. 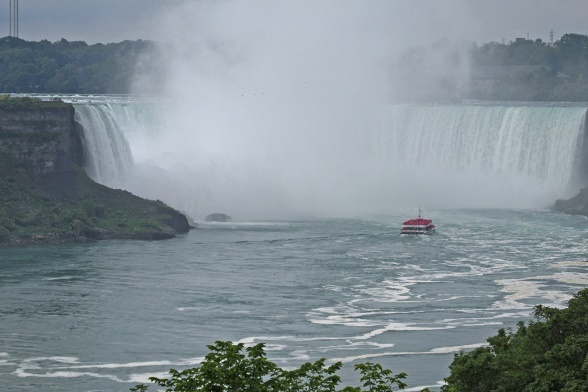 The next morning, everyone boarded buses for a quick trip to the Falls and a ride on the Hornblower sightseeing boat, all atired in unbecoming "mist ponchos." 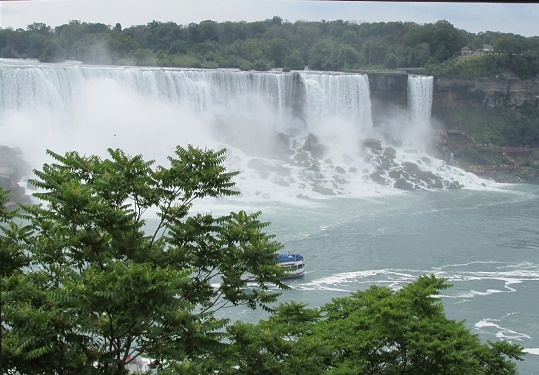 Mike and Sandy were surprised, during a lunch time visit to a big winery, that the Niagra Falls region grows all sorts of grapes, and not just sweet varieties. 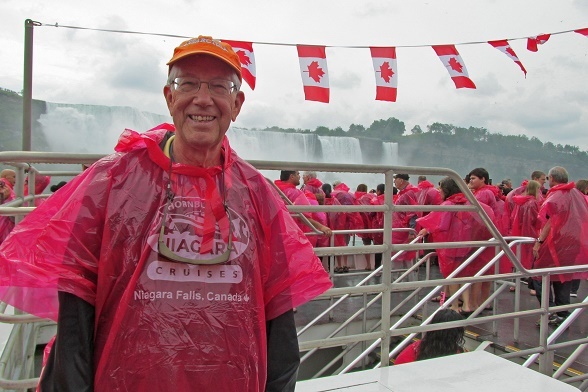 A visit to the cute resort town of Niagra-on-the-Lake rounded out the day of sightseeing, before returning to free cocktails and a great dinner aboard our ship. 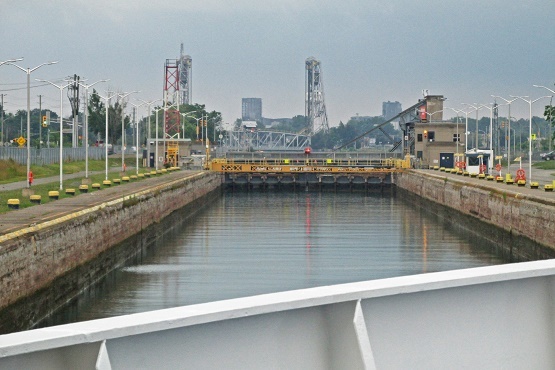 Dipping into U.S. waters, the ship called at Cleveland, Ohio, the largest U.S. city on Lake Eire. 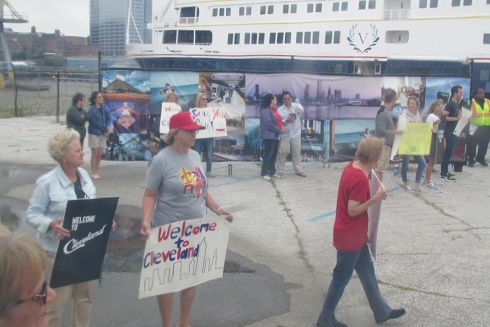 On arrival, the ship was greeted by a singing choir, plus dozens of citizens with "welcome" signs. 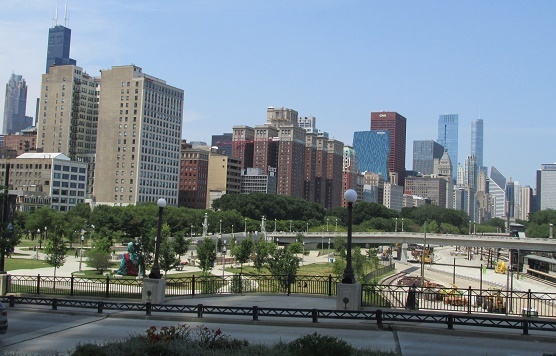 Everyone took a city tour, including an interesting European-style market, a fascinating cemetery (did you know John D. Rockefeller is buried in Cleveland, not in New York, near an assasinated U.S. 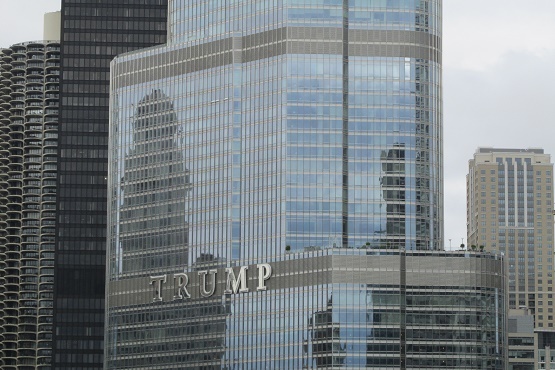 President? 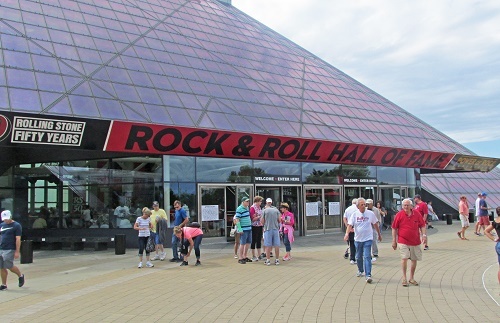 ), and the Rock and Roll Museum and Hall of Fame. 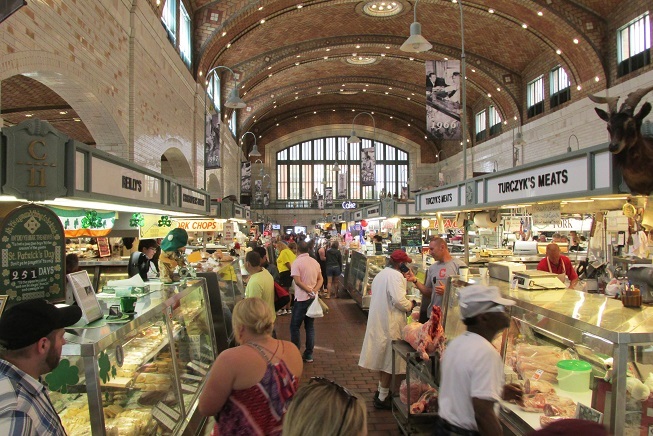 Cleveland was a surprise in several ways -- there is more history and famous people connected to the city than we knew, and the city itself proved to be quite attractive. The R&R Museum is certainly louder than the Country Music Museum Sandy and Mike recently saw in Nashville, but in other ways, rather similar. Change of plans! 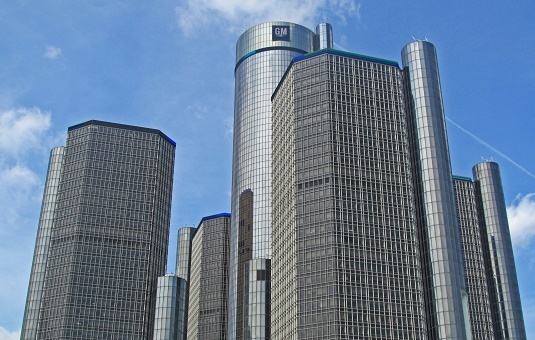 We were expecting to dock at Windsor, Ontario, right across the river from Detroit, but turned out we docked in downtown Detroit, right next to the Rennaisance Center, a cluster of highrise buildings which includes the GM headquarters. 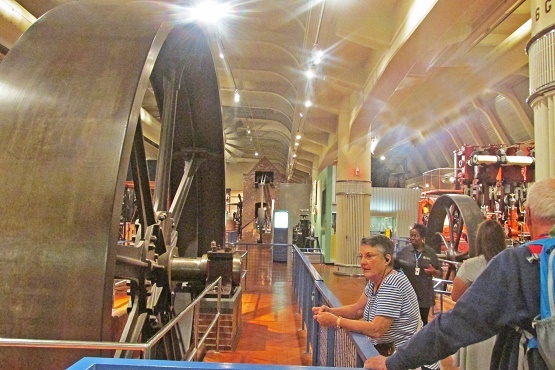 Buses took us to the Henry Ford Museum in nearby Dearborn. 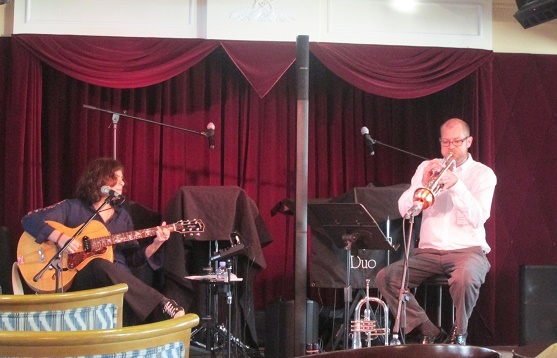 (By coincidence, Mike and Sandy happened to have been there last summer.) And also unexpected, the shore tour included a stop at the Detroit Institute of Arts, one of the largest art museums in the United States -- who knew? 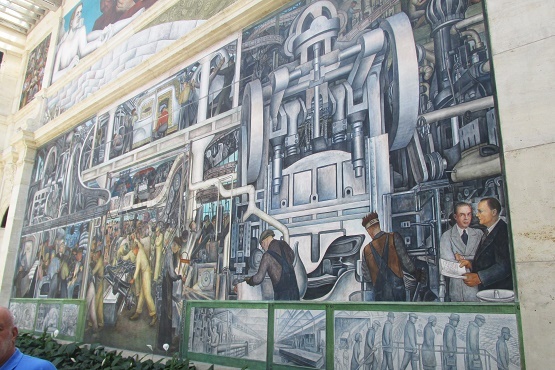 There were way two many works of art to mention, but here's one of the famous huge lobby murals, depicting life in automobile factories in the 1930's. 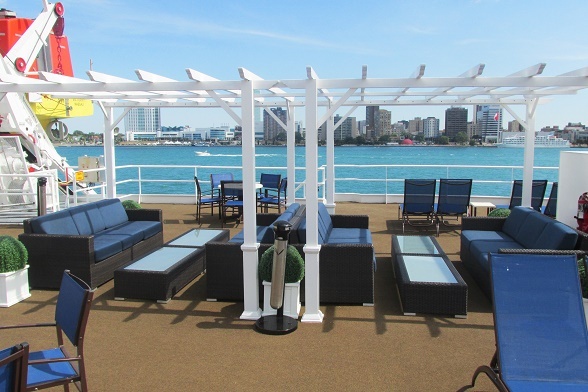 With all back on board, the ship sailed due north through St. Clair Lake, and up the St. Clair river and into Lake Huron. 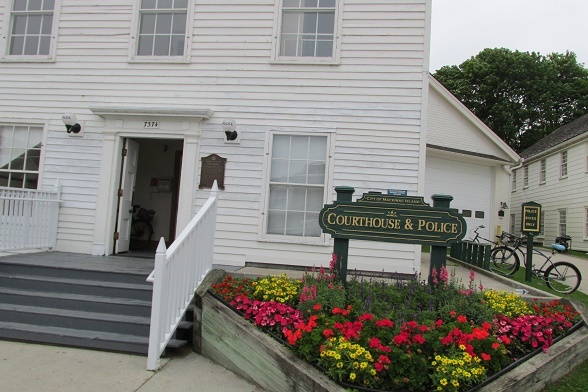 After two nights and a full day of sailing on Lake Huron (these lakes are really big), we came to the small town of Little Current, on Manitoulin Island, which happens to be the largest island within any fresh-water lake in the world. 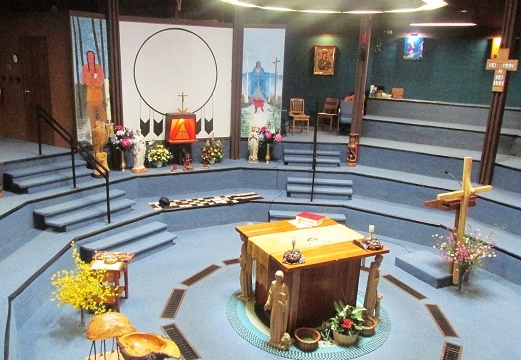 We drove out to a Ojibwe Tribe area, and visited a church with blends Roman Catholic and traditional Indian beliefs and themes. 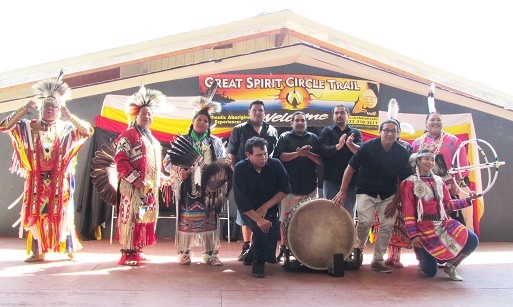 At the Ojibwe Cultural Center, we saw a series of native dances. 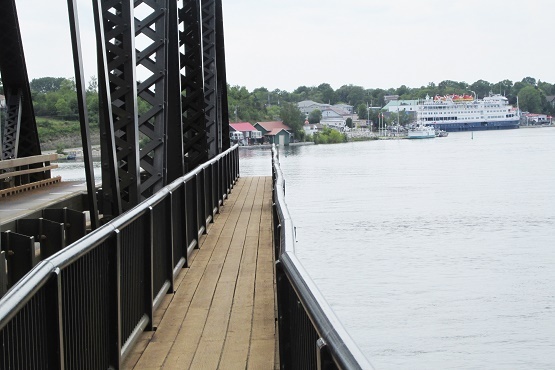 Back at the ship, Mike walked out onto an old-fashioned swing-type bridge, and waited until it opened to let some boats go by - this is what their ship looked like off the end of the open bridge. 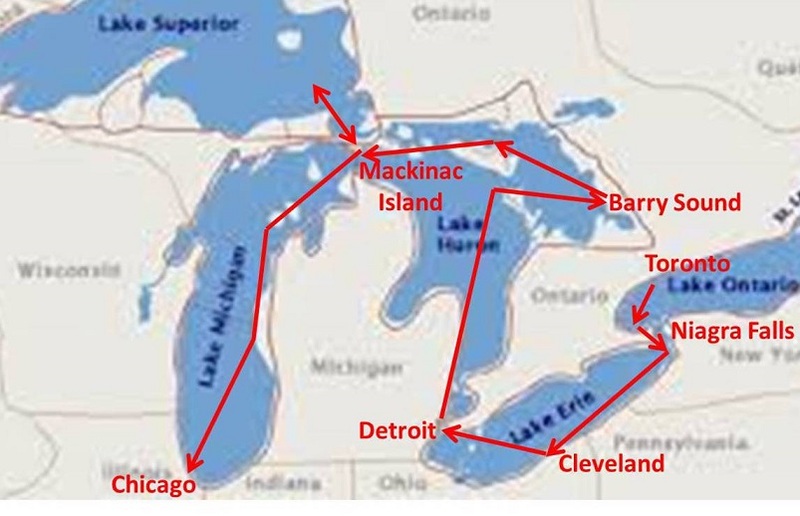 The ship sailed on west, and transited the Soo Locks, which were what allowed us to touch all 5 of the Great Lakes. 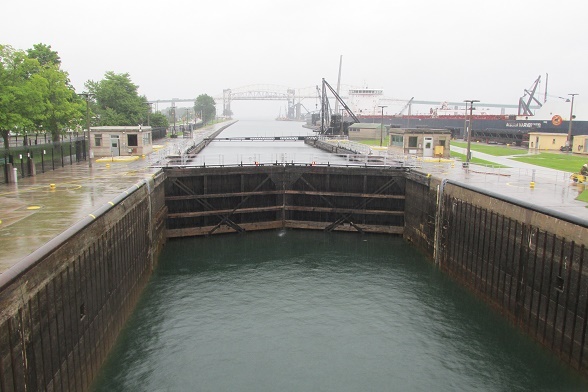 After a bit of scenic cruising, we turned around, went back through the locks again, and docked at a Soo St. Marie museum devoted to Greak Lakes freighters. 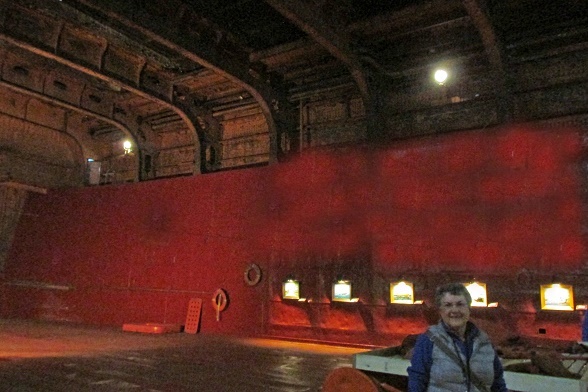 (Here's Sandy inside one of the enormous cargo holds -- this ship used to haul iron ore.) We also had a moment to have a beer with some old friends who have a summer home along the shores of Lake Huron. 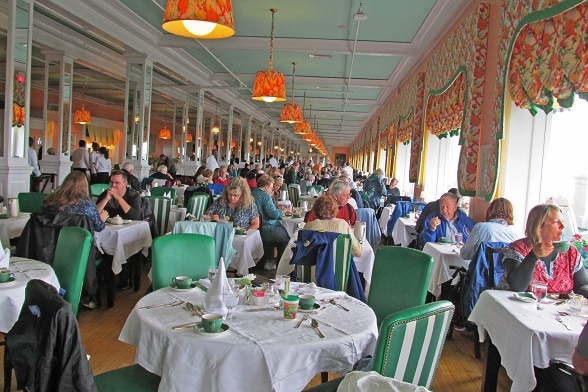 Not the largest island, but maybe the most famous, is Mackinac (say "Mack-in-awe") Island, which is almost under the long and high Mackinac Bridge, which spans the (what else?) 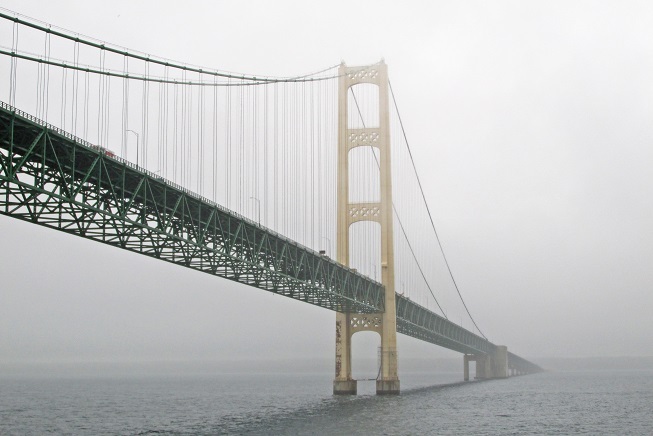 Mackinac Straight, which connects Lake Huron to Lake Michigan. 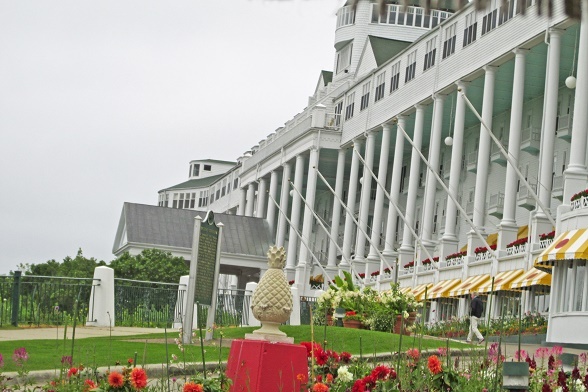 The Island has a huge old Victorian-era hotel, called the Grand Hotel, where the 1980 Christopher Reeve movie "Some Where in Time" was filmed (and where we had lunch). 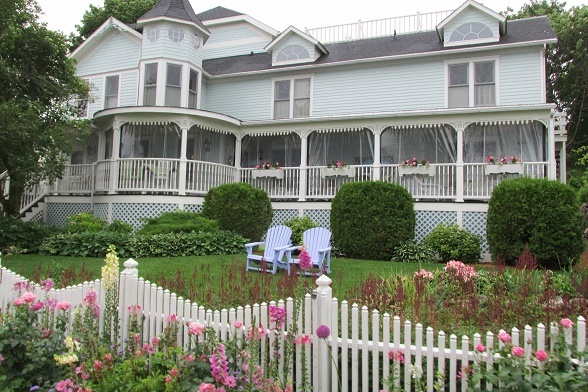 The elegant hotel is surrounded by Victorian and Queen Ann-style homes and gardens. 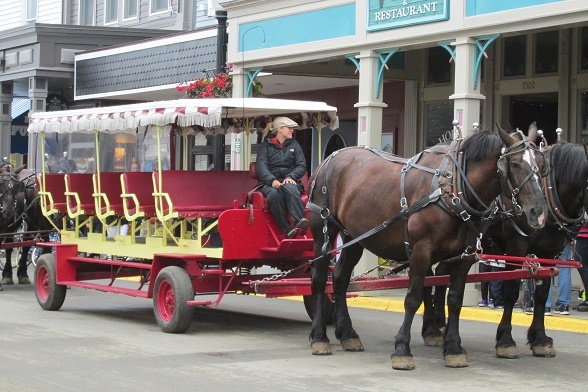 There are no cars allowed on the island (but lots of horse-drawn carriages, plus hordes of bicycles), adding to the cuteness factor. Tourists come in droves. 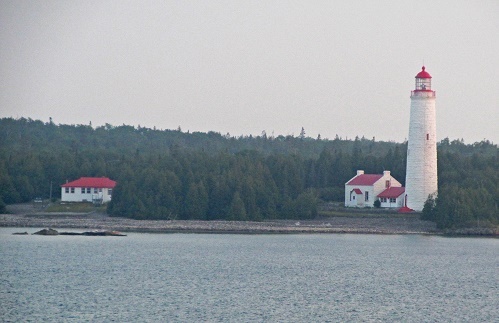 The island also has an old Army fort, which became prominent in fur trading days, and was active until almost 1900. 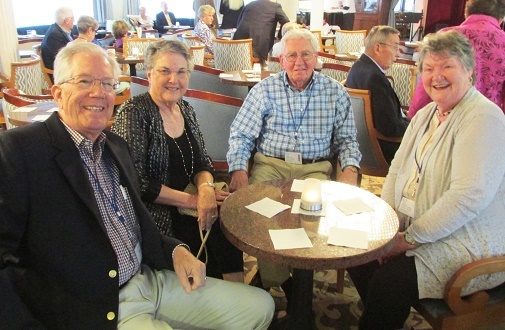 In the evening, the "Official Historian" of the Grand Hotel came on our ship to provide a humerous commentary of the construction and early days of the hotel. 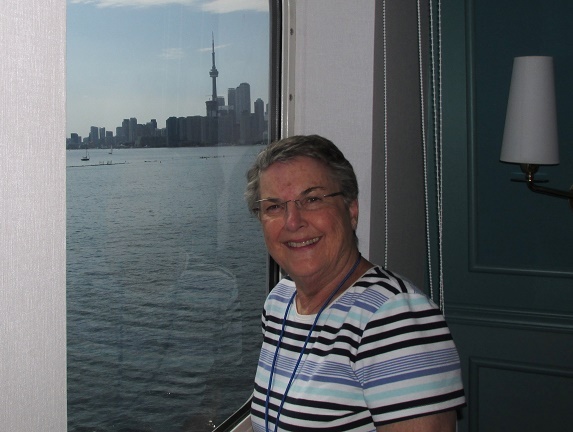 Now the ship swung into Lake Michigan, where we turned south for a day of leisurely cruising, heading for Chicago. 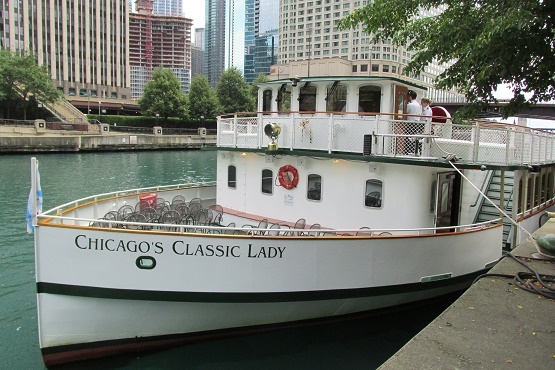 Of course there was the farewell dinner on board, but Mike and Sandy's trip wasn't over, as they had booked a post-cruise stay in Chicago. 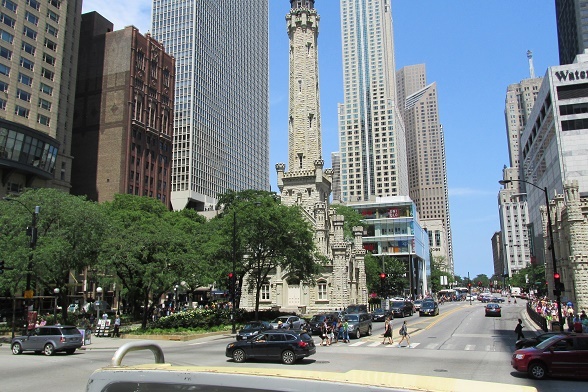 Chicago has a few pre-fire buildings, like the old Water Tower, but big buildings dominate the skyline. 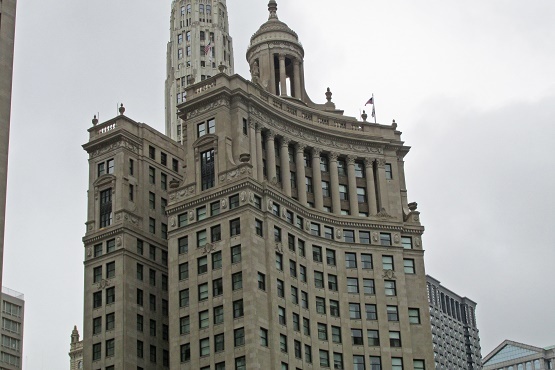 Some of the big guys are rather famous, some super modern, and others rather historic, like the classic Wrigley Building. 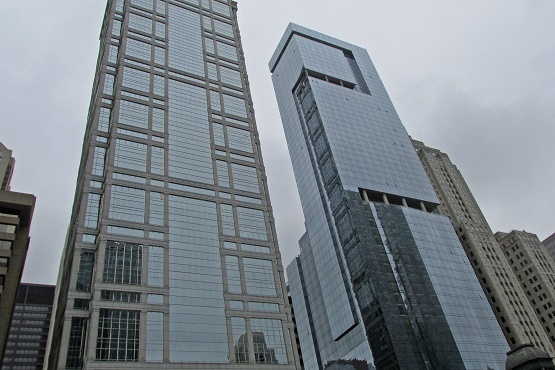 Sandy and Mike took a fun boat tour on the Chicago River, organized by the Chicago Architectural Foundation, and also took in the shows at the world-class planetarium.